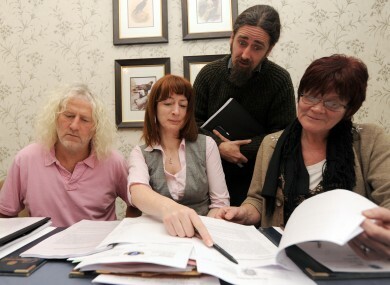 Collins (right) with Flanagan, Clare Daly and Mick Wallace at a press conference about the penalty points controversy last December. THE PEOPLE BEFORE Profit TD Joan Collins has admitted that the controversy surrounding Luke ‘Ming’ Flanagan’s penalty points has impacted on the reputation of independent deputies in the Dáil. Flanagan has been mired in controversy for the past week after he admitted that he had two sets of penalty points wiped from his record including one set which were wiped after he wrote to gardaí claiming he was exempt under a rule regarding travelling on Dáil business. Flanagan had previously attempted to expose what he and three other TDs, including Collins, claimed was widespread quashing of penalty points from drivers’ licences with as many as 50,000 points wiped over a four-year period. “I think you have to accept it will have some impact,” Collins told TheJournal.ie yesterday when asked about the damage to the reputation of independent TDs this week’s revelations may have caused. This latest controversy follows the furore surrounding Mick Wallace’s under-declaration of VAT last year which caused him considerable embarrassment and led to calls for him to resign his Dáil seat. Flanagan has also faced calls to resign this week. Contrary to a report yesterday, Flanagan cannot be ejected from the Dáil Technical Group – the grouping of independent TDs for the purposes of speaking rights in the Dáil - and so far no attempts have been made to ostracise the Roscommon-South Leitrim deputy. Flanagan did not return a request for comment yesterday. Collins said that Flanagan’s actions were “out of order” and “wrong” and said she was particularly disappointed given she had been one of the deputies who named some of the high-profile public figures alleged to have had penalty points wiped from their licences in the Dáil last year. “I put my neck on the line in trying to expose the situation,” she said. Collins said it was the nature of the Technical Group that Flanagan could not be ejected from it as it was a grouping constituted purely for speaking rights in the Dáil chamber. “If Michael Lowry applied to come in we couldn’t stop him. That’s the nature of the beast, it was put together for speaking rights. That’s really what it is, so he can’t be ejected,” she said. The Dublin South-Central TD insisted that the issue of penalty points being wiped was still relevant and claimed that raising the issue has led to TDs being targeted in the media. Collins would not be drawn on whether Flanagan should resign from the Dáil or not. “I’m not going into that territory,” she added. Email “Ming points controversy 'damages reputation of independents' - Joan Collins ”. Feedback on “Ming points controversy 'damages reputation of independents' - Joan Collins ”.